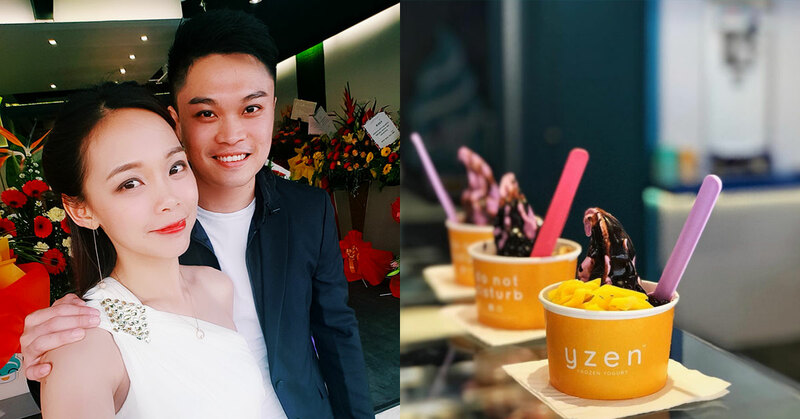 Yzen is a Malaysian brand of frozen yogurt started by former accountants Raymond Chan and Yeany Wong in 2017. 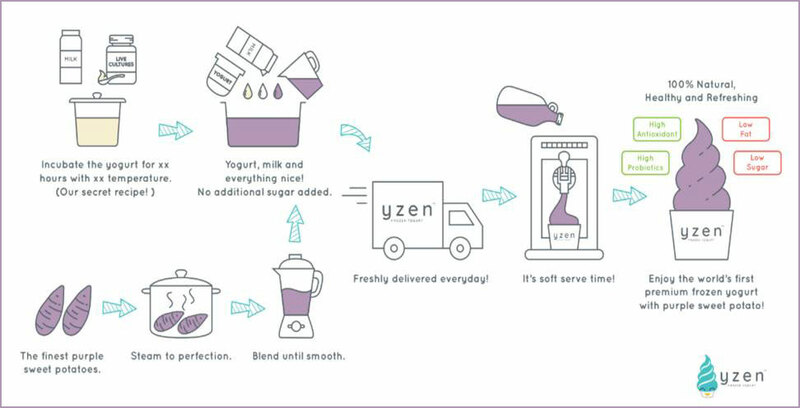 Yzen’s frozen yogurt uses purple sweet potato as a sugar substitute to make their frozen yogurts healthier and better-tasting. There are currently two outlets—one in Cyberjaya, and one in Subang, with five more planned by the end of 2019. There was a point in time where dessert-lover and ACCA-certified accountant Raymond Chan used to consume ice-cream in large quantities. Using his little ice-cream maker at home, Raymond would prepare himself batches of ice cream that he’d consume himself every week. “Eventually I decided that this lifestyle couldn’t keep going on as the extra calories started reflecting on my waistline!” he joked. Caught in a quandary, Raymond eventually remembered that his family had been in the habit of making their own yogurt for years. 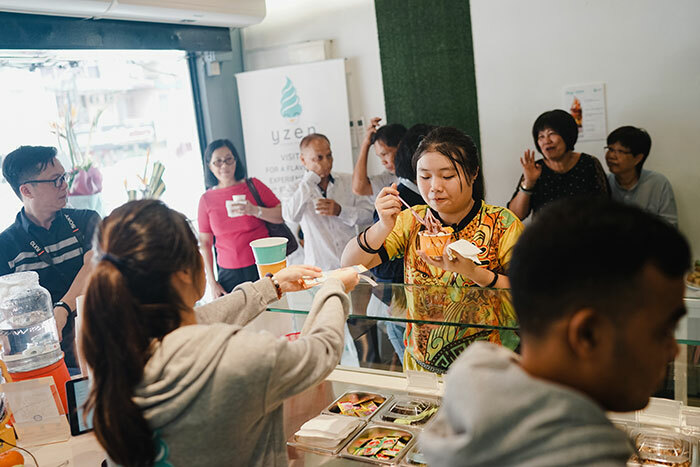 Eventually in late 2017, Raymond teamed up with Yeany Wong, another accountant and dessert lover, to create Yzen—their very own brand of frozen yogurt—with their very first outlet in Cyberjaya. In trying to set themselves apart, Yzen create their frozen Yogurt using purple sweet potatoes as a substitute for sugar to give it a sweeter and creamier texture without the added calories. Additionally, they also include high amounts of probiotics (2.9 billion per gram) to back up the point of their product being a healthier alternative to other desserts like ice cream and cakes. 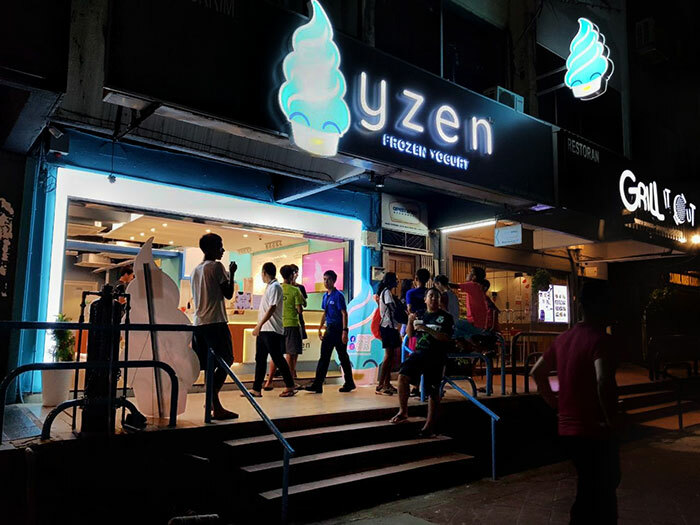 According to the provided list of benefits, one cup of Yzen’s frozen yogurt provides the daily required amount of probiotics at a price point of RM5.90 per small cup (regular cups cost upwards of RM13.90 and larger cups cost RM17.90 and above), somewhat competitively priced compared to other similar frozen yogurt brands in the market today. Addressing the issue of the fickle nature of food trends, Raymond and Yeany both said that they were confident enough in their product to survive in a Malaysian F&B industry with no shortage of dessert options. And instead of wanting the market all to themselves, they also welcomed the prospect of having more options in the local frozen yogurt scene, with the idea that more options would also mean more awareness and mindshare amongst consumers. Right now the challenge faced by Yzen is keeping up with the hectic pace of the F&B industry. As a brand just over a year old, Raymond and Yeany are constantly against the clock when it comes to growth. 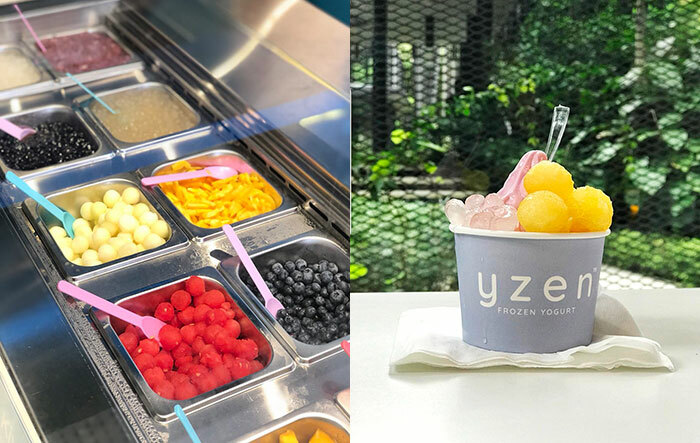 And on the subject of growth, Yzen are enjoying a healthy reception to their frozen yogurt products, something Raymond and Yeany are using as encouragement for future expansion plans. Moving forward, Raymond and Yeany revealed the strategies that they plan to use in order to remain sustainable in the long run, with the first being the decision to maintain premium standards on all their products. Currently, they claim that they use ingredients imported from overseas and create their sauces in-house without the use of additives or preservatives. Also, they plan to leverage on collaborations and membership schemes to create better market engagement. They also currently have a family membership plan which is free to join that provides customers free frozen yogurt on their birthdays, a further 20% off any purchase during the birthday month. Also, customers will get 10% off their total bills as future store credit. As for future plans, Raymond and Yeany hope to open five more outlets in addition to their current two by the end of 2019 with plans to open in Setapak Central Mall well on schedule. To know more about Yzen, visit their website and Facebook page.